For the first time in 2019, the Blues are on the road tomorrow for a first ever trip to Broadhurst Park to face FC United. Following two defeats over Christmas, Chester battled back to earn a hard fought point against Southport at the Swansway on New Years Day. Chances were at a premium, but the Blues looked defensively solid in the goalless draw. FC United had a festive period to forget. Three games from Boxing Day to 1st January brought three defeats. However, a double against Chorley and a match against Spennymoor were difficult fixtures – it will be the sides they face around them which could define their season. Chester completed the permanent signing of Akwasi Asante on Thursday – but he has missed the last three matches due to injury. Danny Livesey and Gary Stopforth also missed all three, and Scott Burton is drawing ever closer to full fitness. The two sides played out a goalless draw back in September, the Blues had their chances but could not break down a stubborn FC United defence. Dave Chadwick took temporary charge for that game following the departure of Tom Greaves – and they are now managed by Neil Reynolds, who left Bamber Bridge to take the role at Broadhurst Park. Following the reverse fixture, the Blues went on to win away at Boston United. This was the Blues last away victory in the National League North – hopefully they can change that come 5pm tomorrow. Kick off tomorrow at Broadhurst Park is 3pm. The Sat Nav postcode for the stadium is M40 0FJ. 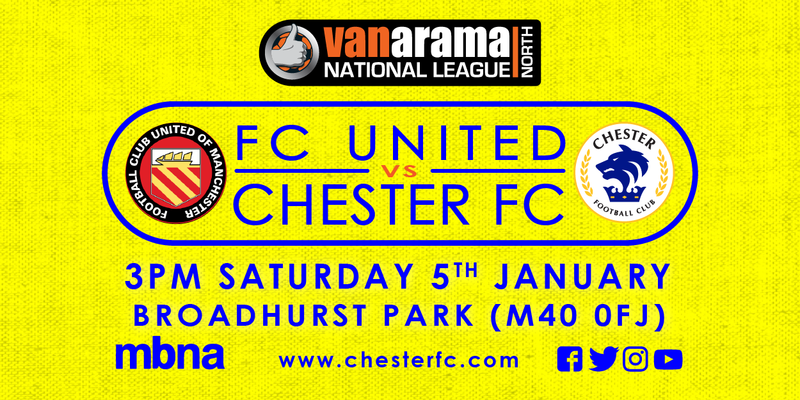 Ticket sales at the Swansway Chester Stadium are now no longer available for tomorrow’s match vs FC United. However, we can confirm that tickets will be made available on the day of the game at the away turnstile before the match. Please note, the remaining tickets are standing only. We’d like to thank FC United for their assistance in being able to provide this service to our fans. See you tomorrow! Can’t make the game? Well the Blues have got you covered tomorrow!